Check it out. It’s the pasta of all pastas! Well, it is for us Paleo people. As most of you know, grains, carbs, and dairy are a no-no when eating Paleo, so what does that mean? No pasta. Say what? You’re telling a 100% Italian gal that she can’t have pasta? Try again. I’m only kidding. I know that was part of the choice we made when deciding to go Paleo, and I honestly don’t regret it. Do I miss pasta every now and then? Sure. Do I feel better without it? You can bet your bottom dollar I do. So, when I came across Cappello’s in my Paleo Magazine, I thought, this has to be a joke…Paleo-approved pasta at the click of a mouse? Done! It took me sometime to actually order it though. Their pasta is pricey since it’s fresh made and shipped on dry ice, but I finally bit the bullet, and am here to blog about it. I went for the Taste of Each and got 2 fettuccine, 1 gnocchi (say ‘in-yok-ee‘), and 1 lasagna. Don’t get me started on all the wrong ways to say gnocchi. My hubby drives me nuts on purpose by calling it ‘n0-kee.’ He knows better than to argue with this Italian girl. 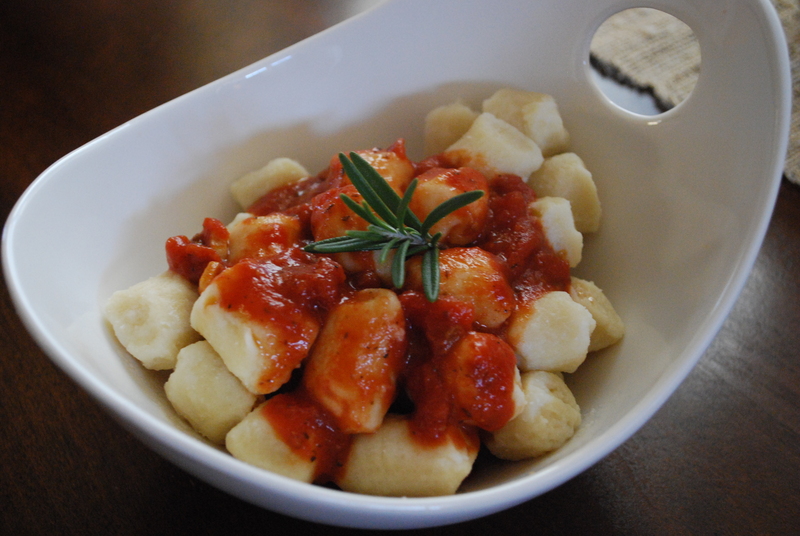 After some deliberation, and trying all 3 kinds, I would have to say the gnocchi is a bit mushy. Maybe because it’s been forever since I’ve had it, but Josh did agree and he’s the non-gluten eating guy. 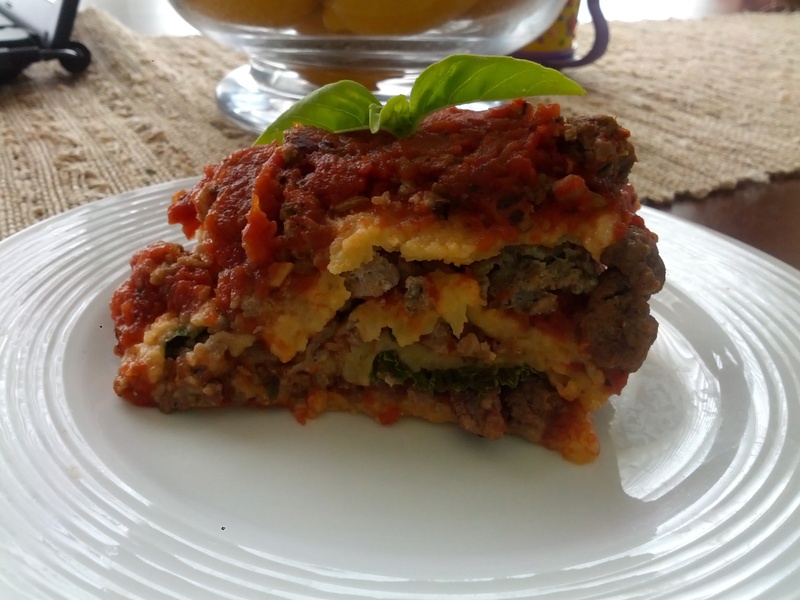 The fettuccine and lasagna both have a bit of a mushy texture to it, but it’s not terrible. Just slather it with sauce, veggies, sausage, and grass-fed beef and it’s all good. 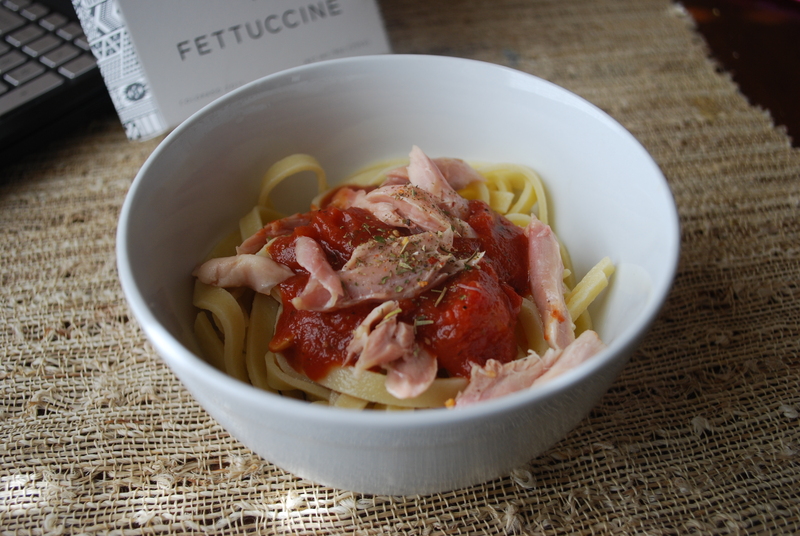 You can always keep is simple with just some homemade pasta sauce and shredded chicken. Here’s the lasagna I made the other day. It’s completely dairy-free, as in zero cheese on it, and has kale instead of spinach. I’ll be back to post the recipe of this mouth-watering meal, complete with two meats. The cool thing about it, was I made two small pans, so we could eat one that night and freeze one for later, so it will be ready when baby comes. Winner, winner, lasagna dinner! Well there you have it, gluten, dairy, and grain-free pasta delivered to your doorsteps. 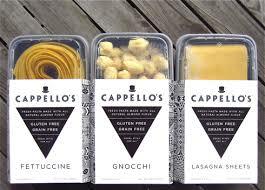 Have you ever tried Cappello’s or heard of it before? Or will you continue to enjoy your big bowl of carbs while laughing at me for giving up pasta? It’s cool, I made my pasta-free bed and will continue to lie in it. Note: Photos are from here and here. I can not wait to try these noodles!. Uff this is a relieve for me, thank God I found this, because of my condition (ulcerative colitis) I’m on the specific carbo diet, this will help me so much, thanks! Glad you found it and hope you like it! I’m so glad to hear you have Cappello’s in Dallas. We are leaving the Boulder, CO area, near where the pasta is manufactured, to hit the road full-time and I have been concerned as a Celiac that I wouldn’t find it during our travels. Thanks! You’re lucky to live where it’s manufactured! I’d totally stock up before you left…I actually had to order it online. It’s not in stores here, yet. This pasta is not grain free. It contains xanthan gum which is made from corn (a grain). Many celiacs and others with sensitivities cannot have corn. Additionally, most corn is GMO. I didn’t even realize that until I looked it up. I asked the company what it’s derived from–looks like it could be corn, wheat, dairy, or soy. That is bad news either way 😦 Thanks for letting me know!